Launched to the 46ft fishing vessel "Jean Howard", who had suffered steering failure near Hartland Point. Vessel was taken in tow for Appledore. Launched to a body-boarder being swept out to sea off Woolacombe Beach. As the ILB proceeded, 2 surfers paddled out to assist Boarder. The casualty was escorted ashore before the ILB arrived on scene. The ILB was soon stood down. Launched following a report of a Father and Son missing in the water off Westward Ho,. After a shorline search the two were found ashore safe and well and all units stood down. Launched following a report of a Father and son missing in the water off Westward Ho. After a shoreline search the pair were found safe and well ashore, and all units stood down. While preparing for an exercise, the station took a call from the coastguards saying a yacht was adrift in the River Torridge. The ILB located the yacht, with no-one aboard, and towed it to a safe mooring. Crew: J Pavitt (Helm) N Ayres L Newcombe. Request to launch, following a call to say a male was threatening to jump from Bideford Quay, when the ILB arrived on scene, it was reported the male was safe and well and could return to station. Crew: P Evans (Helm), N. Ayres, S. A. Clark. Station took a phone call from the coastguards, saying a dog was in difficulties 1/2 a mile off puttsborough Beach, and that a male was going to attempt to swim out to it, as crew were changing another call was taken that the animal had made shore safe and well and stand boat down. Request launch of the ILB to a kite surfer thought to be in difficulties nr the lifeboat station, as crew were changing, the kite surfer could be seen from the station ashore safe and well, so launch was cancelled. Launched to assist ILB in searching for a female thought to be in the water near the station. A women was found on the mud flats in a distressed condition and airlifted to hospital by Sea King helicopter. Crew: G Stanbury (Helm), J Atkinson, S Moles. Requested to launch for a female thought to be in the water near the station. The female was found on the mud flats in a distressed condition by the crew, and flown to hospital by rescue helicopter. Launched to the 28ft becalmed yacht Lazy Bones who had suffered engine failure. With 2 POB off Morte Point, the yacht was taken in tow to Appledore where the engine could be repaired. Crew: M Cox (Cox'n), G. Stanbury (Mech), A. Atkinson, N. Ayres, A. Short, J. Atkinson, S.Moles. Launched to a male cut off by the tide on Zulu Bank, as the ILB made its was the casualty was observed by the station as being chest deep in the gut making his way ashore, as the ILB arrived in the area the casualty made shore safe and well. so the ILB returned to station. Crew: N Ayres (Helm) J Pavitt, O Atkinson. Other Assisting Units: WestwardHo CRT Westward Ho Lifeguards. Launched to a broken down motor boat Near the torridge Bridge. Vessel with one person onboard was Towed back to its moorings. Requested to launch to a windsurfer near the Lifeboat station. When crew arrived at station, the wind surfer was out of danger. While leaving the refueling berth, the lifeboat was summoned to a yacht with a fouled propeller at 100yrds away, The yacht was taken in tow to Appledore quay. Boarding boat launched to back up the ILB, as there were reports of now 2 person's in the water at Bideford. The boarding boat stood down once confirmed that both were now out of the water. Other Assisting Units: Devon & Cornwall Police, Devon Ambulance Service, Westward Ho CRT. Launched to a female in the water at Bideford Quay. When the Boat Launched it was found that a Police officer had also entered the water to assist and when the ILB arrived on scene the pair were being helped out of the water by bystanders. Other Assisting Units: Devon& Cornwall Police, Devon Ambulance, Westward Ho CRT. Launched to Assist with 500ton dredger which was derelict. Adrift in the river Taw, the crew were only to make sure no one was aboard the vessel, the ship was being monitored while drifting up and down the river on the tide. Launched to a small boat drifting down the river Taw at Yelland. When the ILB arrived on scene, it was noted that the vessel had broken away from its moorings at Fremington quay. The boat was towed back to moorings near the Lifeboat Station. While on Exercise the ILB was diverted by coastguards following a call from Devon & Cornwall Police to a male in the water at Bideford. Further details followed 5 mins later to stand down as the casualty was in Brixham Harbour. While on Exercise the AWB was Diverted by Coastguards following a call from Devon & Cornwall police to a male in the water at Bideford Quay. Further details followed 5 mins later to stand down as the casualty was in Brixham Harbour. Launched following a 999 call from a father on Westward Ho beach, saying his 11 yr old son was surfing, and had lost sight of him. As the ILB was nearing the scene a call came to say the 11yr old was out of the water and was safe and well. Other Assisting Units: Westward Ho CRT. ILB Launched to assist 3 persons trapped on rocks with an incoming tide at Putts Borough Beach. The Helicopter and ILB arrived at the same time, so the helicopter winched the casualties to safety while the lifeboat stood by. Launched to 2 teenage boys in the water at Instow, the ILB arrived on scene just as they boys exited the water safe and well. Launched to a small Dinghy seen drifting in the river Torridge between Instow and Appledore, ILB Located the Dinghy with no-one in it and towed it back to Appledore. Launched to a dinghy adrift near Bideford Quay. When on scene there was no-one aboard the vessel and it was towed back to Bideford Quay. Launched to assist the All weather lifeboat and Ilfracombe lifeboat in a search in Bideford Bay. Launched to assist Ilfracombe Lifeboat in a search after a small fishing boat was found drifting in Bideford Bay. After 30mins of searching it was found. The vessel had come from Wales the previous day. All were safe and well ashore! While on Exercise the lifeboat was Diverted to Investigate of a poss 2 persons in the water off Croyde beach, On Arrival the ALB found 2 surfers leaving the water and in no Difficulty. 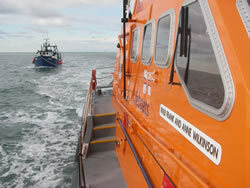 Once confirmed the lifeboat proceeded with its exercise. Crew: O. Atkinson (Cox), P. Evans (Mech), A. Atkinson, J. Pavitt, J. Atkinson, J. Short. Request Launch following a 999 Call to say 3 Children were missing in the water off saunton Sands Beach, just as the boat launched the boys Exited the water safe and well so all units were stood down. Just as the crew were finishing a capsize drill, the station recived a call to say a male was in the water off Appledore quay trying to swim towards Instow and was being carried away by the incoming tide. As the boat launched the station had another call to say he had managed to make shore safe and well a little further up river. Launched to a 16ft fishing boat Broken down in Bideford bay with 2 POB, Vessel taken in tow and towed back to Appledore. Launched to a small Boat adrift nr the Torridge Bridge, When on scene it was found to have broken its moorings with no one onboard, vessel was towed back to Appledore. Launched following a call by the LOM to 2 kitesurfers in Difficulty off of Crow point, As the ILB arrived on scene the casualties had ditched there gear and swam for the shore. The ILB recovered all gear and the 2 males and took them back to their Departure point. Launched to assist 2 canoest with children onboard in Difficulties Nr the lifeboat, the casualties were found by the lifeboats near crow point and escorted back to Appledore. Launched to a 17ft speedboat which had an engine fire and could not re-start their engines, the casualty was towed back to Instow. Other Assisting Units: Instow CRT, Devon & Somerset Fire Brigade. Request launch from Devon & Cornwall police following the finding of two pairs of children's shoes on the riverbank at Barnstaple. Following a search of the area, nothing found all units were stood down. After more enquires the police located the 2 children safe and well ashore and at school. Other Assisting Units: Croyde CRT, Devon & Cornwall Police, Rescue Helicopter 169. Paged to launch for a dog being swept away by the tide at Instow Beach. As crew were being assembled the animal made shore safe and well. Paged to 2 persons cut off by the tide at Baggy Point. The crew stood down as boat was being launched as casualties made shore safe and well. Launched to an 18ft RIB with Engine Failure off Greencliffe Westward Ho, Vessel was Towed back to Instow. Launched to a large trimaran fouled up on a naviagation buoy near the lifeboat station. The casualty was freed from the buoy and escorted to safe moorings. Launched to a female who may have jumped from the Torridge Bridge. After a thorough search of the area - and nothing found - all units were stood down. Launched to a female who may have jumped off the Torridge Bridge, After a thorough search of the River, a nd nothing, found all units were stood down. Launched to Assist the ILB in Refloating a Cabin Cruiser on rocks at Down End, Vessel Refloated by All Weather Lifeboat and Towed back to Appledore by the Inshore Lifeboat. Crew: M.Cox (Cox'n), J.Pavitt (Mech), A.Atkinson, M.Williams, A.Hallet, P.Atkinson. Launched to Cabin Cruiser Ashore on Rocks at Down End, ILB placed one man ashore to assess the situation, Before calling for back up and pump from the ALB. Launched to the fisging vessel Bruno of Sutton with 2 pob. She was broken down 7 nautical miles east of Lundy. The vessel was towed, in dense fog, back to Appledore. Launched to assist Devon and Cornwall Police to a female threatening to jump from the Taw Bridge at Barnstaple. As the boat was proceeding to the scene, a report came through to say the female was safe and well in police custody. On this information, all units stood-down. Launched to assist a 24ft fishing boat with 2 persons on board, (pob), with engine problems at the Middle Ridge Buoy and needs urgent assistance. The ALB arrived on scene and took the vessel in tow to Appledore. Launched boarding boat following a report by a member of the public of a yacht drifting down the river Torridge. The boarding boat found a yacht adrift with no-one onboard and towed it to safe moorings at Appledore. Launched following a 999 call to the coastguards of a small boat Adrift off of Instow,and not sure if anyone was onboard. The lifeboat found the Boat Drifting with no-one onboard and Towed the vessel to a mooring as it had parted its own. Crew: A.Short (Helm) G.Stanbury S A Clark. Whilst performing routine training on the all-weather lifeboat on its moorings, the boathouse called to say a kite surfer was in difficulties astern of the Boat at approx 1/2nm distance. The boarding-boat picked up a Kite surfer and landed her ashore safe and well near by, before resuming training on the all weather boat. Crew: M.Cox (Helm), P.Evans, S. Moles. Members of the public reported that a yacht may be adrift off instow, the ILB was launched to investigate,the crew found the yacht in question fouled up in its moorings. once the crew made sure the yacht was secured they returned to station. False Alarm. The ILB was requested to launch to a report of a dinghy capsized in the River Taw with 2 persons on board, (POB). When the lifeboat arrived on scene nothing could be found. After a search the ILB came across 2 lads fishing off a hulk of a fishing boat. The lads were taken ashore as they would have been on the wreck for several hours. A False Alarm. Launching for a missing Elderly Lady in Barnstaple, launch cancelled as lady was found safe and well ashore. The Tamars First Service! Appledores all-weather Tamar-class lifeboat launched to several calls to coxswain of a 25m Ex Fishing Vessel adrift in the River Taw. The vessel was taken in tow and returned to its moorings at Yelland. ILB requested to launch to a report of 2 children being blown out to sea off westward ho beach in an Inflatable Dinghy, R169 on scene and reported that the children were now safe and well on the beach, The ILB was stood down when nearly on scene. Appledore's Atlantic 75 launched to a report of a small yacht adrift off Instow Beach. The ILB located the yacht with no-one onboard and towed it to a secure mooring. The ILB launched to a 5mtr fishing boat broken down at anchor at Barnstaple. The Iifeboat towed the vessel to Castle Quay, Barnstaple so it could be recovered from the water. Launched Borarding Boat (BB-502) to a female threatening to jump from the Torridge Bridge. The lifeboat stood by while police coaxed the female off the Bridge. Launched to a report of an 18-20ft boat adrift in the River Torridge Near the Old Bridge, The ILB found the vessel with no-one onboard,so it was placed on a secure mooring. Appledore's Boarding Boat BB-502 launched to Assist the ILB after red flares were seen in the River Torridge/Taw near Crow point. After a short while and a quick search of the River it was deemed the flares had come from inside the Burrows Area Inland. False Alarm. The ILB launched following several reports of a red flare seen in the River Torridge/Taw area near Crow point. After a short while and a quick search of the River it was Deemed the Flare came from inside the Burrows Inland. False Alarm. Boarding Boat BB-502 Requested to launched to a Dog trapped on a sandbank near the White House at Crow Point. The owner had tried to rescue the dog, and found it too dangerous. The local rescue helicopter on exercise nearby at the time offered to help and airlifted the animal to safety. Appledore's ILB launched to a paddle-boarder possibly in difficulties off Baggy Point. Rescue helicopter R-169 overflew the area and reported that the boarder appeared to be without difficulty. The ILB continued to the scene to confirm the initial report. As darkness was closing in, the crewman aboard the boarder took advice from the crew and a lift ashore.